The Dark-eyed Junco (Junco hyemalis) is best known as the slate-gray "snowbird". It forages in flocks under winter bird-feeders flashing white outer-tail feathers as it flies to nearby cover. Before 1973 scientists classified juncos in five separate species with marked differences in plumage across North America. Juncos are now "lumped" within a single species with distinct forms. The prominent forms are: Slate-colored (most widespread); Oregon (with pinkish brown back and flank; Pink-sided; Gray-headed; Red-backed (resident mainly in the Southwest); and White-winged (breeding in the Black Hills and wintering in the Colorado region). The Dark-eyed Junco sings a gentle trill at the end of winter, more musical and slower than a Chipping Sparrow. The Dark-eyed Junco is a year-round resident in the Appalachian Mountains, eastern states north from Pennsylvania to Nova Scotia, the Great Lakes region, and western states from Colorado to the Pacific, excluding the lower southwest and interior California. The Dark-eyed Junco is a winter resident only in the remainder of the continental U.S. and central Mexico. Dark-eyed Juncos also breen in Canada and Alaska. The Yellow-eyed Junco, resident only in southern Arizona, has a yellow eye and rufous back and wing-covering feathers. The Black-chinned Sparrow of the southwestern states and California has brown-streaked wings and back. 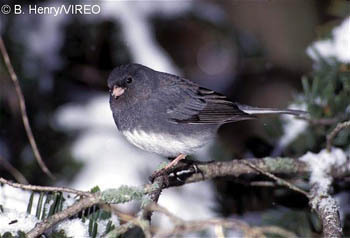 The Junco prefers forest edges and cleared areas, the banks of stream and road cuts, and exposed rocky slopes. Flocks migrate in the fall over dunes and lakeshores. Juncos usually nest close to the ground, often in fallen trees. Depending on the region, breeding habitat may be anywhere from sea level to 11,000 feet. Juncos are primarily seed-eaters; they also help to control periodic outbreaks of spruce budworm in the Northeast. There is evidence that cats kill a significant number of ground-foraging juncos.